I won a free twist out hairstyle today. Great timing too because I wanted to blow dry my hair and wear a twist out on dry hair. The night before I was scrolling thru my Instagram feed and saw this. 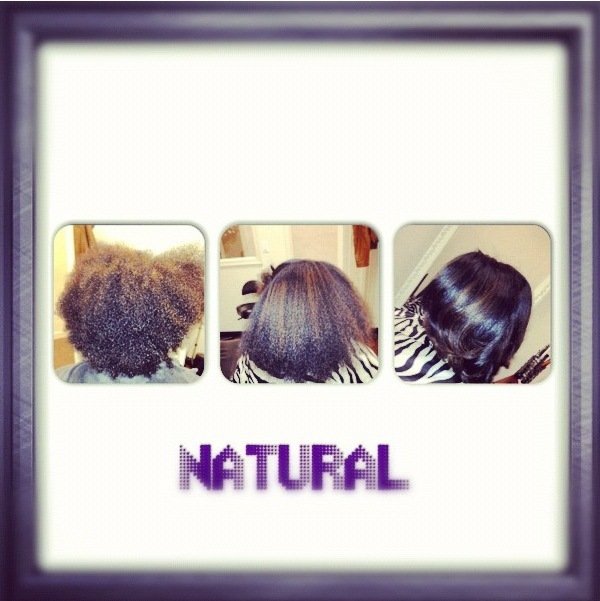 Nappstar is a natural hair salon. 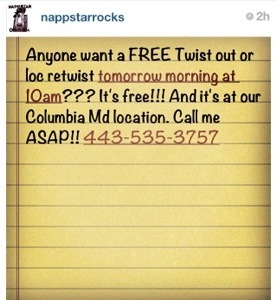 The owners and stylists of Nappstar are two sisters in Maryland. 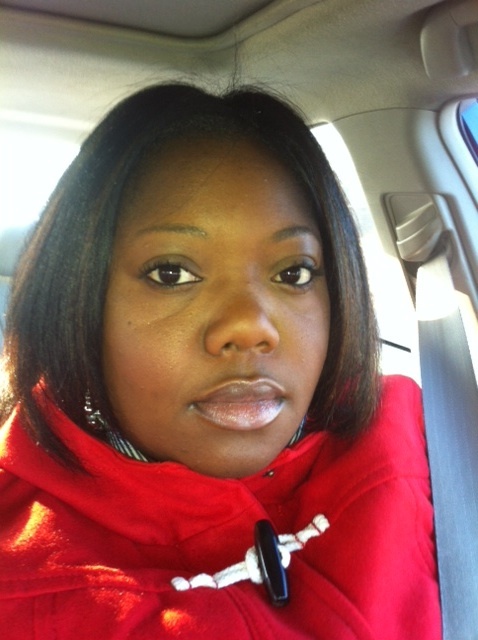 I had been to Nappstar several times before and was always happy with my results. So I called and got the 10am appointment. They moved their salon to a new location a while ago were looking to find additional natural hair stylists to work with them in their salon. In order to evaluate the potential stylists’ abilities and skills, they issued a call for anyone with natural hair to be the test “dummies” for lack of a better word. I believe they had 4 female stylist to work on 4 ‘model clients’. Two clients had natural hair and the other two had locs. (I don’t like the term “dread” locs, so you won’t see/hear me use it too much). They rotated the stylists between twisting and styling the locs and natural hair clients to test their skills. My twist out was done in flat twists in a star pattern (think bicycle wheel with the spokes coming from the center). The process for me from wash to twist out, including the blow dry and time spent under the dryer was about 2.5 hours. The outcome was decent and more importantly it was free. I will say that I would probably never go there for a twist out in general. Not because they wouldn’t do a good job, but typically I do my own twist outs and twist outs for me don’t last long enough for me to shell out that kind of cash for a very temporary style. But for anything else I’d definitely recommend these sisters. I must admit that I have visited the Miss Jessie’s Salon in SoHo- New York City, and received a twist out. Maybe I’ll blog about that later. I will say I was very pleased with my results and it lasted at least two weeks. BUT the twist out at Miss Jessie’s was an individual two-strand twists that had great hold because of the product, causing the twist out to be super defined and long-lasting.